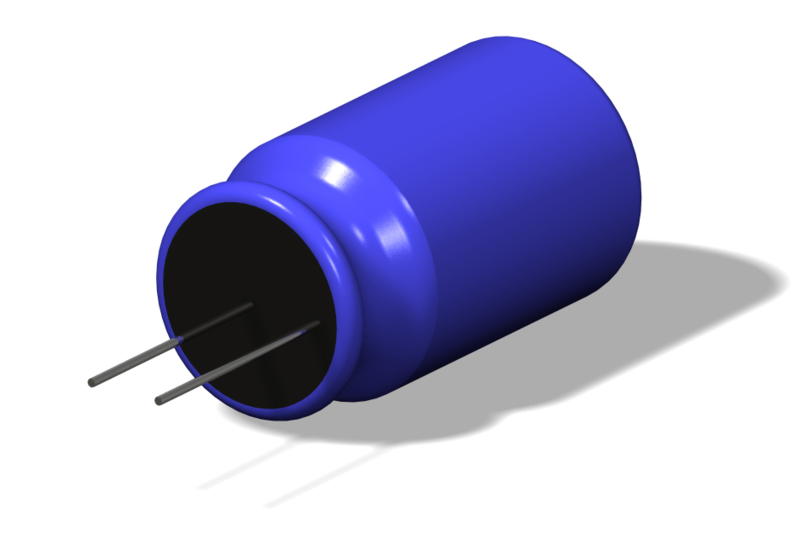 Capacitors are a very common gadget in almost any electric circuit. Capacitors are kind of like electrical springs. When you push down on a spring, you give it some energy. If you let go, the energy comes back out of the spring. You can use a capacitor in a circuit to make electricity “bounce” back, or you can use it to smooth out bumpy electricity. 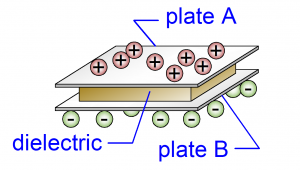 Here is a look at how a capacitor works. A capacitor is actually a very simple thing. 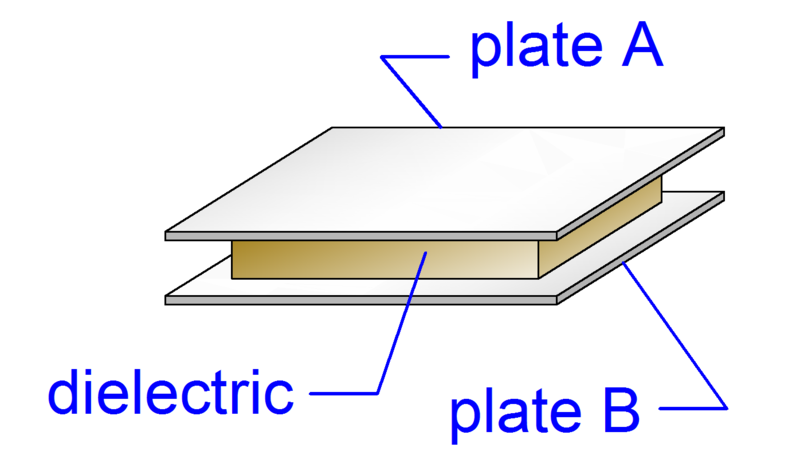 For the most part, it is just two metal plates separated by a piece of paper, plastic, or other material that does not conduct electricity. 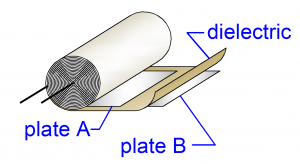 You might think they would call this separator an insulator, but they call it a dielectric. It just sounds fancier. The dielectric keeps the electric charge from moving from one plate to the other. The thing is, the opposite charges really want to be together. If enough of them get together, they can break down the dielectric (but this doesn’t usually happen unless something goes horribly wrong, and it usually involves smoke). 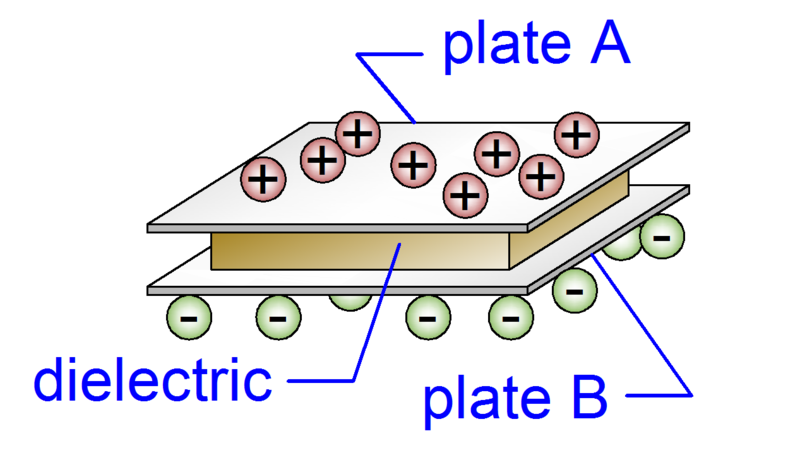 The charge builds up on each of the plates, until they can get another way around the dielectric. Usually there is some other part of the circuit they can go through. Most circuits that use capacitors use them to store and send back charge many times a second. Most capacitors look like little cans. Here is what is inside the can. You don’t really want to take one of the cans apart, sometimes they have bad stuff inside them that can make you sick. 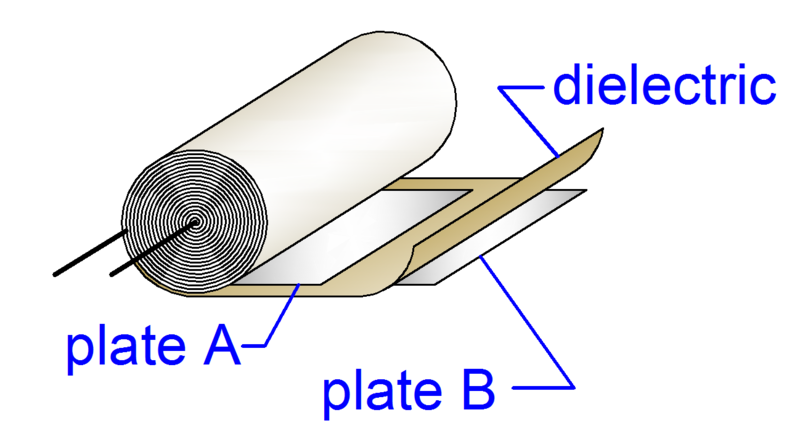 As you can see, it is pretty much the same as the other pictures, it’s just two plates separated by a dielectric all rolled up into a handy can shaped package. They symbol for a capacitor looks pretty much like a capacitor itself. It is just two parallel lines. The amount of charge you can cram into a capacitor is measured in units called farads. ← Saturn V Model Rocket 1:10 Scale! Thanks for the brief explanation of a capacitor.